Morning sunstars found on shorelines around Calvert Island. Photos by Jenn Burt (top), Joel White (left) and Nathaniel Glickman (right). 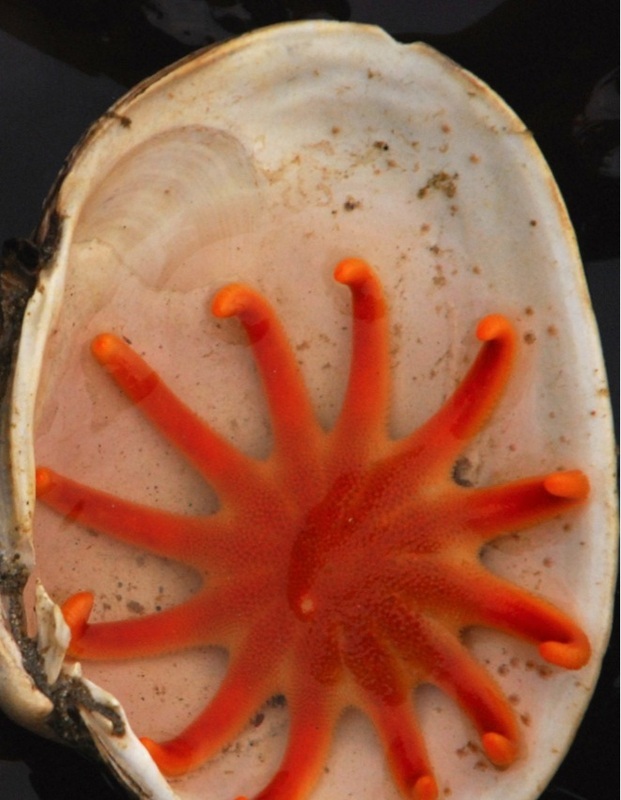 This large sea star (diameter to 40 cm) is usually a solid orange-brown colour, though it can also be red or a mottled orange-brown. Its rays taper from base to tip, and usually number 11 or 12 but can vary from 8 to 16. Its wide disc composes about 1/3 of its total diameter. This sea star has a fairly smooth dorsal surface. 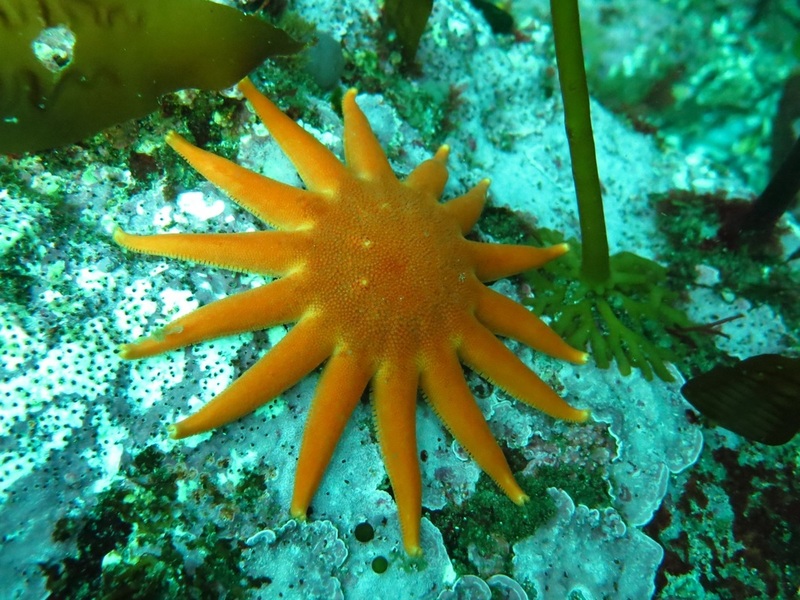 The morning sunstar is a common species, and is found in intertidal zones to a depth of 414 m. It is most commonly found in rocky areas, but also occurs in gravelly and sandy habitats. Its range stretches from Point Franklin, Alaska to Monterey Bay, California. The morning sunstar could be confused with the sunflower star, Pycnopodia helianthoides. The sunflower star grows to a larger size, does not have the same smooth dorsal surface as the morning sunstar, and has more rays (up to 24). 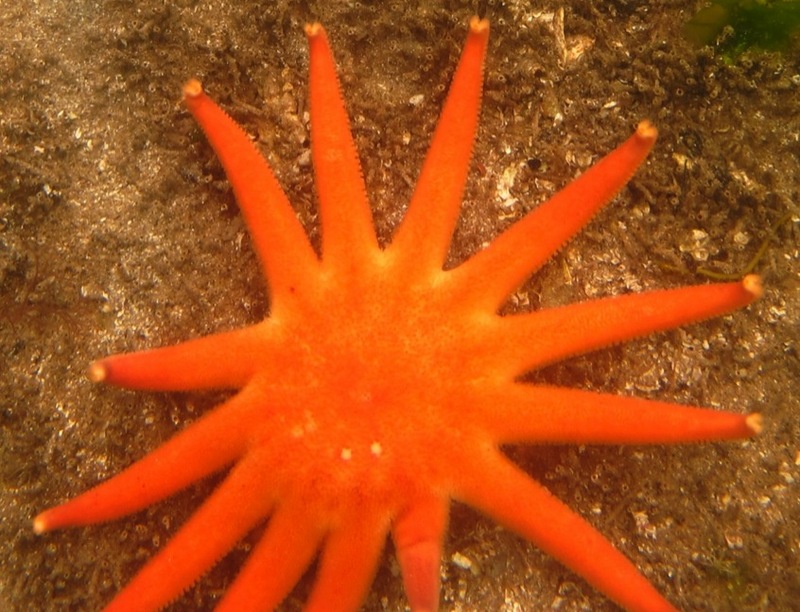 The morning sunstar will prey on individuals of its own species, as well as other sea stars such as the larger sunflower star, sea cucumbers, and the diamond back tritonia nudibranch. Some sea star species and the nudibranch exhibit escape responses when preyed upon by a morning sunstar. Cowles, D. (2005). Solaster dawsoni Verrill, 1880. Invertebrates of the Salish Sea. Rosario Beach Marine Laboratory. Accessed 03/01/2014. Harbo, R. M. (1999). Whelks to whales: Coastal marine life of the Pacific Northwest. Madeira Park, BC: Harbour Publishing. P. 132.